Municipality of Wawa (Single Tier Algoma)Record Owner? Log in. The name is Ojibwa for 'wild goose,' and when the first post office opened in 1899, was spelled Wa-Wa. The first post office closed in 1908. In 1898, William Teddy and his First Nations Peoples wife discovered gold on the shore of Wawa L., starting one of the biggest gold rushes in Ontario history. In 1933 the post office reopened as Wawa. In 1951 the name was changed to Jamestown to honour Sir James Dunn, a New Brunswick native who became one of North America's greatest industrialists and, in 1935, chair and president of Algoma Steel Corp. of Sault Ste. Marie. Dunn died in 1956, and in 1960 the community name was changed back to Wawa. 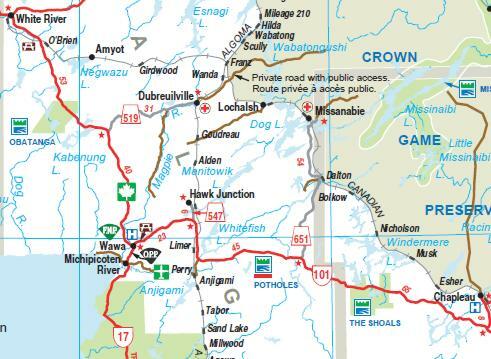 Have something to say about Municipality of Wawa (Single Tier Algoma)?